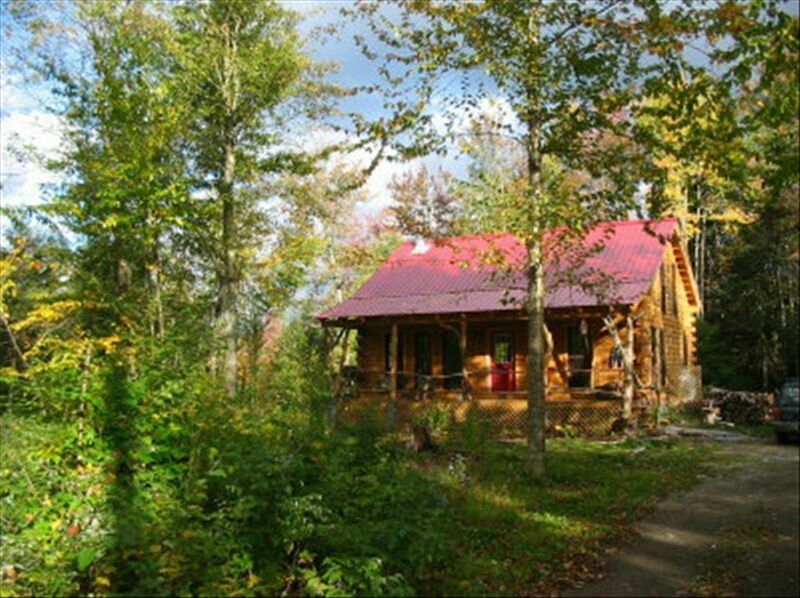 A New Log Home: A Unique Recreation Rental Opportunity, Available Year Round in the Stowe area of Vermont. A cute, cozy dream tucked away in the woods of Vermont. Completely private and yet close to everything. Only minutes outside of Stowe. This Log Home is a great place to share with friends and family in a beautiful secluded setting. Indoors you can feel the warmth, charm, and uniqueness of Vermont. The two bedrooms are cozy and make you feel right at home. There is also a loft that can sleep two more on a futon. One bathroom has a sunken cedar bathtub that is big enough for two. So enjoy a long soak in the tub and relax! After a beautiful day outdoors you can also warm up snuggling in front of a fire at the woodstove. The snowmobile trail starts right out the back door and for the cross country skiers, we have the Catamount trail right out the front door which runs down to Stowe and up towards Craftsbury for miles on end. But every season has its charm and we will have a list of beautiful sites ready for you, which sometimes are only known to locals. We also welcome your pets and the backyard is fully fenced in for your four legged family members. If you see this one already rented for the time you desire, we can offer you another cabin just as cute!!! My husband, 18 year old son and I stayed in this cabin Dec. 27-Jan. 1. Claudia was so hospitable and friendly. The cabin was stocked with all basic needs. We went to the grocery store before we got to the cabin which was a mistake. The fridge and pantry were stocked with all staples which we also purchased. Wish we had know that in advance. We loved how private the cabin was. It's beautifully tucked away in the woods. We also loved it's unique style. The cabin is VERY clean. The cute little town of Stowe is about a 10 minute drive which was perfect! Thank you Claudia for the best Vermont vacation ever! Claudia’s cabin was perfect for our weekend getaway. It is cozy, cute and clean! Also impressive that she built it herself. Love that she’s environmentally friendly as well AND welcomes dogs. We have a rescue that hates being left behind so we are always looking for pet friendly places. Claudia was there if we needed but honestly the cabin is quite private. Plenty of space for four adults, 2 dogs and a little one with lots of baby ‘things’. It’s located in the woods but is still close to Stowe, Morrisville and lots of breweries! Would definitely recommend!!!! Creative, quirky, spacious private cabin. Great kitchen and outdoor space. Owner is very friendly, responsive but also gave us our space. Highly recommended. Great location, very cool & earthy cabin. We loved our stay! The cabin was beautiful and so peaceful! We enjoyed a place we could bring our dogs that was VERY dog friendly. Claudia greeted us at the door and shared items fresh from her garden. She was very friendly and responsive! We would love to visit again! Perfect getaway! Claudia was lovely and my dogs were so happy there. Will absolutely go again! Tucked away in the woods of Vermont yet you are close to 3 major skiing areas. Stowe is only minutes away, Smugglers Notch about 35 minutes and Jay Peak about 40 minutes. But if you just want to enjoy the outdoors by cross-country skis, snowmobile or foot you can do that right out the door! The hill behind the house is also really great for sleding! Unique waterfalls and hikes summer and winter are only minutes away and sometimes the little secrets that only locals know about!